Robert Murray was born in Eddleston, Peebleshire the youngest of the seven children of John Murray and Jean Elliot. His father was a shepherd originally from Ettrick where many of his old older siblings had been born. He was presented to the parish church of New Cumnock 0n 10th August 1843 by John, 2nd Marquess of Bute following the Disruption in the Church of Scotland and the departure of the Reverend Matthew Kirkland to the newly formed Free Church. The following week the Marquess presented James Murray, Robert’s brother, to the parish church of Old Cumnock following the departure of the Reverend Ninian Bannatyne to the Free Church. For some time the Murray brothers found themselves in the position of ‘preaching to pews almost empty. ‘ However, eventually fortunes improved and many of the strayed flock flocked back to the parish church. 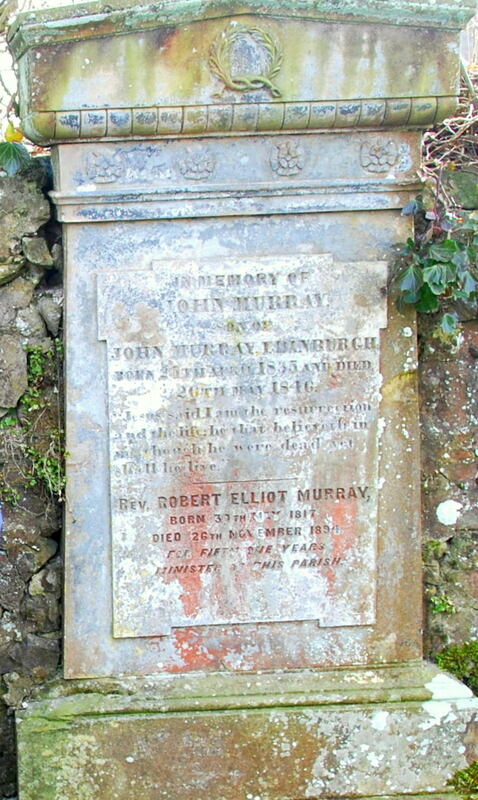 In 1846 family tragedy struck following the death of the minister’s nephew 11-year-old John Murray, son of John Murray, a livestock agent in Edinburgh – brother of Robert Murray. Young John is remembered in the minister’s headstone in the Auld Kirkyard. In happier circumstances and many years later in 1883 the Reverend Robert Murray presided over the marriage of another of his brother John’s sons (born to his second wife) – Robert William Elliot Murray. Like his father he was also a livestock agent in Edinburgh and he married Jane Hyslop, daughter of the late John Hyslop of Bank and Agnes Kirkland [See Discovery Hyslop]. Jane lived at Auchengee Cottage, Pathhead with her widowed mother and the wedding took place in the grand Bank House, now home her brother William. On Sunday 1st June 1861 Robert Murray had the honour of preaching the sermon at the anniversary of the Battle of Drumclog (1st June 1679) when the Covenanters defeated the forces of Graham of Claverhouse. A crowd of 1500 gathered for the conventicle, which is still held annually to this day. Robert’s brother the Reverend James Murray gained a reputation as a poet and among his publications was the excellent “Songs of the Covenant Times by An Ayrshire Minister” (which included a poem on the Corsgellioch Martyrs) an indication that both men embraced the Covenanting traditions of the district. Although certainly not as prolific a writer as his brother Robert also had some of his writings published including “Two chapters on Miracles” (1863) which sold for 6d. In 1886 the Reverend James Millar was appointed assistant and successor to the Reverend Robert Murray, now approaching 70 years old. James Millar moved into the manse and Robert Murray retired Beechbank Cottage, Ayr Road Cumnock. It was here, after serving of the parish of New Cumnock for 51 years, that the Reverend Robert Murray passed away aged 77 years old. He lies buried against the wall of Auld Kirkyard. A memorial in the parish church honours him as ‘An earnest scholar, a faithful pastor, a loving and gentle minister’.